4-year-old Noryasmi skillfully works on her artwork. There is precise grip on each crayon she chooses to use, her young mind having its own way of interpreting things. “She looks forward to this every day,” shares her father, Nas, who has been accompanying her to the child-friendly space since it was set up. 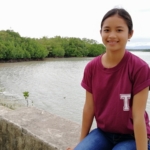 Noryasmi was supposed to enroll in kindergarten last June 5 but the ongoing conflict in Marawi City has affected her and the more than 22,000 school-aged children. According to UNOCHA, the armed conflict has displaced more than 308,000 people to date. Of which, 7% (67,000 people) are staying in 67 evacuation centres while the rest are living with friends or relatives in nearby provinces. It is not easy for Noryasmi and her family to cope with their situation. “We lost our baby during the firefight,” Nas relates. On May 26, three days after the clash erupted, his 9-month pregnant wife, Nazda, was giving birth when they heard loud explosions and gun shots near the place where they were hiding. Nazda was already stressed and shocked from the previous days. Their baby did not make it. She was a girl. The following day, the family decided to escape from Marawi. “My wife was still bleeding but we did not have any choice. We had to leave the city or else we would all die.” Together with their four children, including Noryasmi, they braved the more than 5-hour walk to safety. Since they arrived in the evacuation centre, Noryasmi would ask for her baby sister. She was looking forward to becoming an older sister. Nas would tell her that Allah may have better plans, that their baby may not be for them. Worried that the conflict has affected Noryasmi, he would patiently accompany her to the child-friendly space co-facilitated by World Vision with a local partner. He would watch her play, sit beside her, draw and colour materials with her. “The child-friendly space is more than play and artworks. It is a safe space for children to express their emotions and come to terms with what they experienced. It is also a place where they can interact with other children. Emotional healing may take years but it is necessary to start the process early,” shares Honey Joy Sampiano, World Vision’s Child Protection Specialist. “Life in the evacuation centre is not easy but we’re slowly coping because of the help we’re receiving from different people, even strangers. I feel relieved to see Noryasmi interact with other children and to see her smile whenever she does the activities,” smiles Nas. Aside from the psychological first aid through child-friendly spaces, World Vision, in coordination with the government, has also provided at 2,000 families (10,000 people) with emergency essentials like hygiene kit (toothbrush, toothpaste, laundry soap, bath soap, sanitary napkin, undergarment for men and women, malong/tube skirt) and other items such as blanket, mosquito net and mat. In between the conversation, Nazda arrives to check on Nas and Noryasmi. Her bleeding has stopped and is now slowly regaining her strength. Noryasmi then finished her artwork, filled it with bright colours and submitted it to a World Vision staff facilitating the activity.